What are the contents of your thoughts? What did you find? Errands to run? People to contact? Emails to reply to? What else is floating around up there? positive, but often, our thoughts can tend towards the negative. Negative thoughts about your career, your appearance, your life, your self are common. Negative thoughts are part of what make us human. Known to psychologists as negativity bias, we come hardwired with a sensitivity to negativity. Although in some cases it can help us to be aware of our imperfections and shortcomings, an over focus can sap our energy and take a toll on our self-esteem and our performance in various parts of our lives. Black or White Thinking: Thinking only in extremes (aka all-or-nothing thinking). Arbitrary Inference: Generalizing one negative comment or experience to be representative of everything in your life. Mental Reading: Presuming you know what others are thinking. Catastrophizing: Thinking that the absolute worst thing that can happen, will happen. Emotional Reasoning: Presuming that feelings are facts. “Shoulds”: Focusing on how it “should” have gone down, as opposed to how they actually are. Personalization: Making something about you when it actually has nothing to do with you. Any of these negative thought patterns sound familiar? Also known as cognitive distortions, these styles of thinking often lead to discouragement, frustration, anger, sadness, and a slew of other negative emotions. These emotions lead us to act in ways that oppose our goals! When you’re discouraged and thinking negatively, you’re less likely to take a risk, push yourself hard, or persist with a challenging goal. How Can I Stop This Negative Thinking? Recognizing your own tendencies to think negatively is the first step. Once you’ve identified some problematic thinking, consider the impact those thoughts have on your own feelings, and then in turn your emotions’ impact on your behaviors. Is this type of thinking productive? Is it beneficial for anyone/thing? If not, let’s change your thinking and set you on the right path to getting the thoughts, feelings, and outcomes that will lead to goal achievement, productivity, and happiness. Just simply noticing the negativity can help you to slow down and even stop it. Change your perspective so that you can observe the negative thought from an objective place, as if you were a scientist and the thought were a piece of data. What is that thing? Where is it coming from? Is it productive and in support of your goal? Getting some perspective is the next step in stopping negative thoughts, and getting back on track. When you use your thinking for good and create new, positive thoughts that lead to productivity, you are able to unstick yourself and continue moving forward. Think about your tasks. Not your appraisals/ opinions/ criticisms. This can be helpful at work and during other challenging times in life, but it is especially effective at the gym. If you are thrashing yourself and/or beating yourself up about your weight, your plateaued progress, or some other outcome, shift your thinking to what you are doing in the present moment. See if you can make all of the contents of your thoughts about right here and right now, completing a pull-up with perfect form, feeling every sting and push of the foam roller, or noticing your feet corkscrewing into the floor while you deadlift. If you get present and focused on your task, stress and anxiety will wane, negative thoughts will subside, and you’ll have the added benefit of stronger lifts with better form. I hope you will give some of these recommendations a try. Start with just noticing the content of your thoughts. If you, your training, and your life could be better by pruning away some of the negativity, let’s go! Remember, you have the power to change your thinking. Actually, it’s all you – no one else. Keep in mind that repetition fosters habits and shapes beliefs. Your negativity may be automatic, and you will therefore need to practice the skills listed above to create new habits of productive habits and beliefs. Changing your thinking is possible and effective! It will have positive effects that cascade into every area of your life. Want to stay in the loop on other great health tips? Subscribe to Mark Fisher Fitness’ weekly email list. Dr. Lisa Lewis is a licensed psychologist with a passion for wellness and fitness. 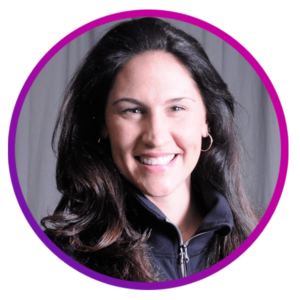 She earned her doctorate in counseling psychology with a specialization in sport psychology at Boston University, and her doctoral research focused on exercise motivation. Lisa is also a certified drug and alcohol counselor, and is a part-time lecturer at Northeastern University. Lisa has worked in college mental health, community mental health, and substance abuse treatment centers, and she currently provides consultation and psychotherapy services at her private practice in Brookline. She also provides consultation and workshops for personal trainers and strength coaches, both for their own professional development, and to enhance their communication and motivational skills with their clientele.